Art NuVogue: Alice Comes to Life! We're All Mad Here!!! Hehe! Hello my dears! 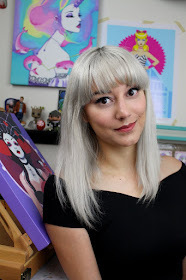 On this episode of Art NuVogue I'm working on the first in a series of Wonderland themed paintings for my upcoming solo show entitled, "Let Them Play Croquet" Check out my artistic process and follow me from inspiration to completion! Hi! First of all. Your artwork is amazing and really inspiring. I love this post and I would love to pass along the sunshine award to you! Congratulations :) Please visit my site for details and spread the love!